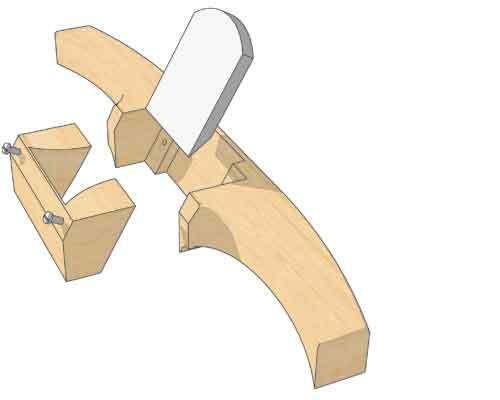 A typical spokeshave is either a light bevel-up design with a cutting angle of 25 degrees or a bevel-down metal shave with a 40 degree angle and a thin blade, fine for shaving chair spindles in straight-grained air-dried stock, but not great for cabinetmaking. They are hard work to use, frequently cause tearout and also chatter across the surface. In years gone by shaves used by wheelwrights and coopers were more akin to hand planes, with a 55-60 degree angle and a heavy thick blade which, when combined with a fine mouth, drastically reduced tearout, and the case for using a high angle in a spokeshave is even more compelling than with a hand plane because the shaving cut is usually much narrower and made without difficulty. Sadly these shaves had a propensity to self-destruct. 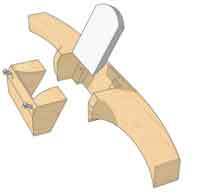 Unlike a wooden hand plane the grain direction is in its width so that the compression of the wedge tends to split the timber over time. 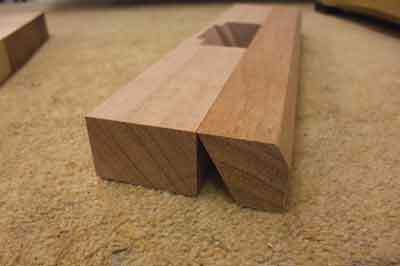 For the same reason a wedge in a through tenon should always be at right angles to the grain. 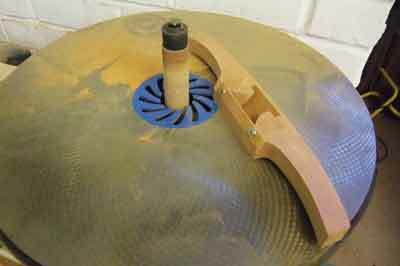 To help overcome this splitting, manufacturers fitted metal strips on each side of the throat, with partial success. The Japanese opted to use their oak, which has a high degree of spring, to resist the splitting effect. However most used Japanese planes that I have seen show some splitting. In recent times HNT Gordon have produced two very fine shaves which overcome this problem with some complicated construction, utilising brass abutments. I still cannot figure out how they have done it, although it works. I have worked extensively with these shaves over the past three years and can highly recommend them although there were a few minor areas that I felt I could improve on. Firstly I increased the bed angle from 55 to 60 degrees to help eliminate tearout and I opted for a massive 6mm-thick blade to add weight and prevent chatter. The blades on the Gordon planes had a tendency to jump when planing rough stuff, so I designed a more sturdy blade-holding method. I decided not to add a brass sole because this needs constant waxing for a smooth cut. I shaped the handles to be more comfortable as well as more sensitive. Lastly I rounded the front and back of the sole which allows my shave to cope with concave surfaces as well as flat and convex ones. This works well and means one shave can be used for 95 per cent of my shaping requirements. My biggest design dilemma was the method of holding the blade securely. In the end I decided to go for a detachable front section that is bolted through into the main body. 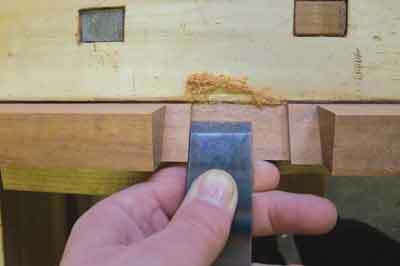 The pressure created by this arrangement pulls the wood together rather than trying to force it apart, so it should last. 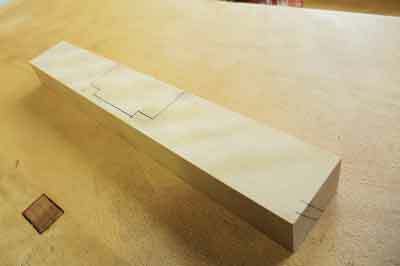 The other advantage of the two-part design is that the beds could be mainly cut on the router table. This is faster and more accurate than by hand. My choice of wood was Goncalo alves, a very hard wearing and stable timber. 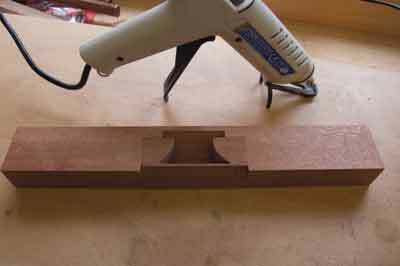 Making an angled support is essential as this could be used as a cross-cut sled on the router table as well as to drill the body holes accurately on the drill press, photo 1. The blade recess needs to be cut 0.5mm shallower than the blade thickness so that the front section applies pressure to the blade. The recess is also 1.5mm wider than the blade to allow for lateral adjustment, photos 2 and 3. 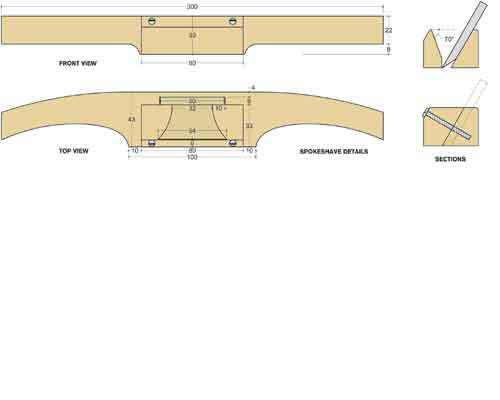 The front section needs to be made from a separate piece which has matching 60 degree angles on the rear as well as on the front top edge. 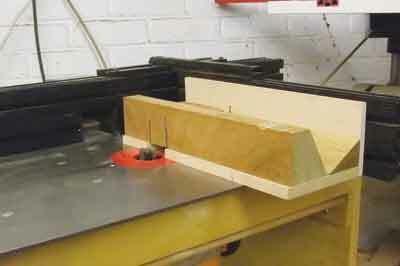 The front escapement is also cut on the router table but at a steeper 70 degree angle, which can be achieved by using a 10 degree shim on the 60 degree sled. It is much safer to make the front section from a longer piece of wood and cut to size after all the saw cuts have been completed, photo 3. 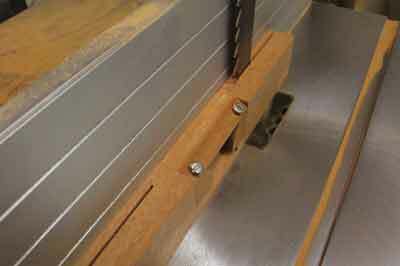 A nice friction fit is desirable and I creep up on this by using feeler gauges between the cross-cut stop on the tablesaw fence. 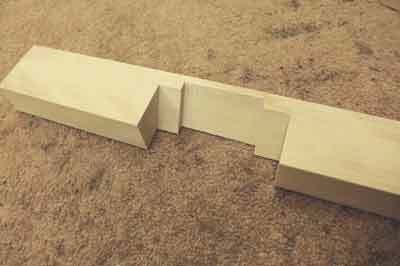 The abutments need to be widened to accommodate the 2in blade at the mouth and these angles are cut with a fine Japanese saw and cleaned up with a square-edged chisel, photo 3. The same chisel is also used to remove the marks left by the machining process to the main body, photos 4 and 5. Drilling for the bolts, M5 stainless steel machine screws with a panhead, must be done with care and accuracy if the blade is to be held securely. The bolts were to be threaded straight into the wood and although this may sound a bit risky I can assure you the holding power is more than adequate for a permanent job. 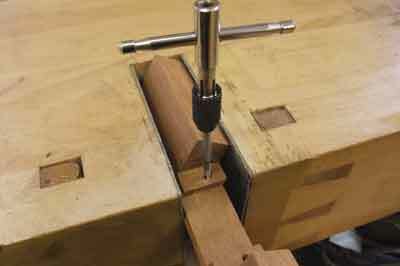 Using a 60 degree sled and a lip-and-spur bit, I adjusted the drill press stop so that it would just mark the main body, then glued the front section temporarily in place with a dab of hot-melt glue, photo 6, and drilled 5mm holes in each side. After knocking off the front section I swapped to a 4mm drill bit which was carefully located in the centre mark left by the 5mm bit. This was drilled to a depth of 13mm and then tapped with an M5 thread cutter, photo 7, taking care to keep it at 90 degrees in both directions. 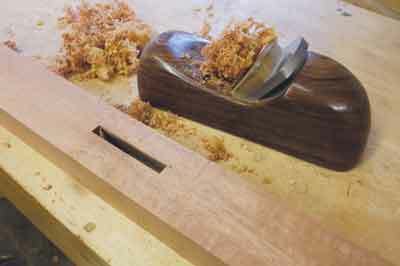 The front section and body are planed flush with each other, photo 8, and the shave is now ready to shape. The first cut is to establish the underside relief and this is done on the bandsaw with the fence set to remove 8mm, photo 9. 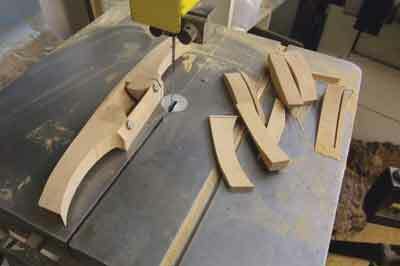 The final curved cut to remove this waste is left until after the other shaping has been carried out. A template is used to mark this out and the remaining shape is cut freehand with a narrow quarter-inch-wide blade on the bandsaw, photo 10, and finished on a bobbin sander, photo 11, and then by hand. Rather than work the handles to a rounded section I decided to leave them square with heavily chamfered edges for comfort. 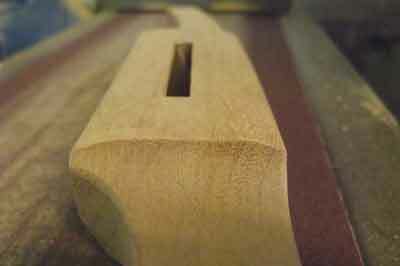 This shape helps with registration of the blade that would be lost with a round handle. Using a belt sander I added gentle curves to the front and back of the sole while maintaining a flat area of 20mm in the middle, photo 12. This would allow the shave to cope with most concave shaping without making its use on convex surfaces any harder. After hand sanding to 240 grit the wood was sealed with two coats of shellac followed by three coats of Osmo Hardwax Oil. The high carbon blades were prepared with a hollow-ground bevel at 30 degrees for ease of sharpening and the back was flattened until the grinding marks were removed. 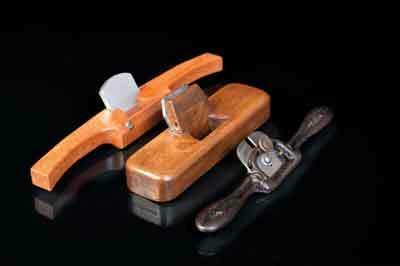 Suitable blades can be purchased for the Lie Nielsen Boggs spokeshave or for the HNT Gordon spokeshave. The thickest and cheapest are old cast-steel blades that can also be cut down but will require more preparation work. This spokeshave is a new and exiting addition to my range of woodworking tools. If you would like to try one, I will be showing them at the twice yearly shows at Yandles in Martock, Somerset, the next one of which takes place from 10-11 September.